Today a few images surfaced on the LEGO servers, showing upcoming sets. 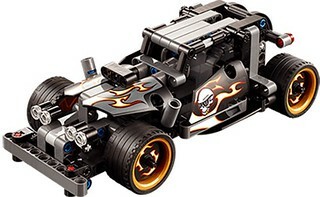 Now we can see what some of the Technic sets will look like! It appears to be a competitor for 42002 Hovercraft from 2013, in theme and functions (moving cylinder engine and turbine as the model is pushed along the floor). 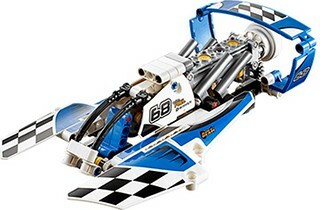 Compared to the former, it should have a higher speed on water, but be unable to travel on land. The only new element I see is a 18944 Technic, Panel Curved 3 x 13, for the first time in blue. One of the year's Pullback Racers. With the golden rims and the black (and sometimes very, very dark grey) colour scheme, if you don't apply the stickers this could be Batman's Hot Rod. I don't see any new elements: neither new moulds nor old moulds in new colours. Up until now, Pullback Racers have appeared in a "road/offroad" duality: 42010/42011, 42026/42027, 42033/42034. Next year will be the trend breaker, with a "police/robbers" theme. 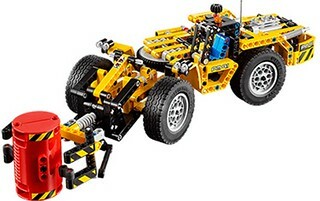 It's nice to see something this unusual for Technic! 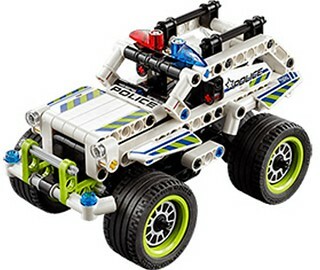 Like "Batman's Hot Rod", with the Interceptor's white and lime colour scheme and the dark greeble on top, it looks more like "Ghostbusters' SUV" to me. Like with its "adversary", I don't see any new elements in it. 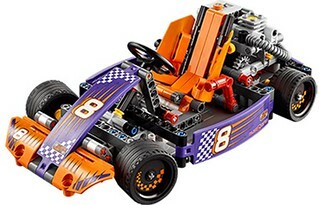 Like the previously-described sets, I don't see any new mould in this one, only 18944 Technic, Panels Curved 3 x 13 in... uh... purple? Oh my, I really hope it's not yet another colour to make parts availability for MOC building more difficult! I hope the colours in the picture are misleading and those panels are in fact dark blue, but comparison with the blue pins in the same picture doesn't give me much hope. From the name, I was expecting a wheel loader equipped with a front shovel, like last year's 42030 Volvo L350F, albeit flatter and in a smaller scale, to complement this years's 42035 Mining Truck. Instead we have a loader that's indeed flat (for working in the cramped spaces found in mines), but has, instead of a shovel, a grabber claw in front. This one should be quite fun to play with, once modified for remote control! The only new element I see is the red half-cylinder, used here twice to make a huge tank for the Loader to pick up. Now we're still missing the images for the following sets. Maybe they're still not available because these are the ones with new moulds? I see a new type of panel on the Hydroplane racer. Those connecting the the blue 3x11 curved panel. They seem to be a new variant from the above!? The red barrel is not a new element it was used before in hero factory figures year 2014. Also in the mine loader and the hydroplane racer there is a new type of panel. These look good for their small size. Really like the go cart. The red lever and 16t clutch gear indicate a gearbox, but can't be sure just yet. Best possible scenario would be some new parts in the gearbox to make it work which might also indicate a possible future large set, like the original clutch gear released in a 1993 hovercraft hinted at the gearbox of 8880 released a year later. But that's just pure speculation, in any case, it looks very good. Is that a yellow 7L axle in the jeep and a red 4L axle in the steering wheel of the kart? Why? Regarding the panels on the boat and the loader: I thought they were these ones, but, after reading your comments and looking better, indeed they appear to be new. I just don't understand how they integrate with the other existing panels, but then again neither does the one we now see in blue and... er... purple. As for the kart, I too don't see what that lever could do: real carts basically have a motor almost directly connected to the wheels (not even with a gearbox or a differential), a single (foot, not hand) brake and a steering assembly. I just don't see what else could need a lever. Finally, the yellow axle looks more like tan to me. But currently the only tan axle is the 4L with middle stop, and two of them don't fit there; maybe it's instead a pair of dark tan 3l axles with stud? Love the hydroplane racer and the mine loader. At first I was meh on the kart but after a while it's brown on me and I like that one too. Can't wait to see pics of the other sets. "Shifter karts are popular in the US. These have a six-speed manual transmission and a clutch, both of which are designed to get the most out of the engine. In the UK (and elsewhere in Europe), karts with 100 cc and 125 cc engines are the preferred type of karts, although 125 cc, 210 cc and 250 cc shifter karts are also used in certain karting categories."